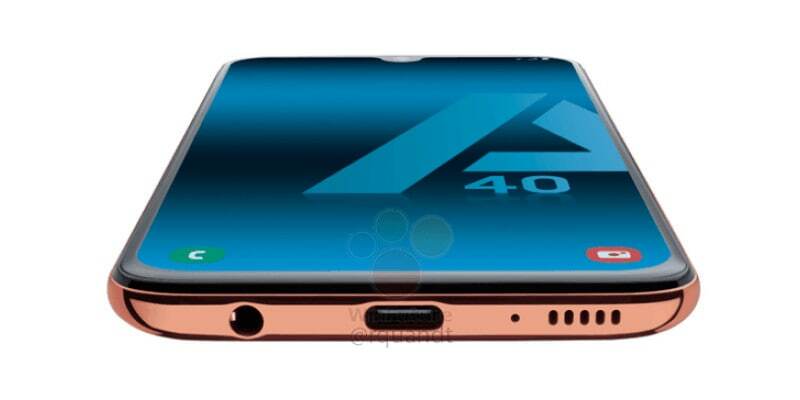 Samsung Galaxy A40 has popped up online in a fresh set of leaked renders, which have revealed the phone's design as well as colour options. Expected to be announced on April 10, the Galaxy A40 is rumoured to be a part of Samsung's refreshed Galaxy A lineup. The Galaxy A Series currently includes Galaxy A10, Galaxy A20, Galaxy A30, and Galaxy A50 smartphones. The Galaxy A40, like the Galaxy A30 and Galaxy A50, will be a mid-range smartphone. The phone is said to sporting a 5.7-inch screen and will be powered by Exynos 7885 SoC. Published by German website WinFuture.de, the allegedly leaked official renders of the Galaxy A40 show that the smartphone will sport an Infinity-U Display with a waterdrop-style notch. The phone will have bare-minimum bezels on the sides and slightly thicker bezel on the bottom. The Galaxy A40 is also seen to be packing a dual rear camera setup with a single LED flash as well as a rear fingerprint sensor. There is a USB Type-C port at the bottom alongside the speaker grille, 3.5mm audio jack, and a microphone. The volume rocker and power button can also be seen on the right side of the smartphone. WinFuture writes that the Samsung Galaxy A40 is believed to feature a 5.7-inch screen, Exynos 7885 SoC, 4GB of RAM, and 64GB of onboard storage. Additionally, the phone will reportedly come with 4,000mAh battery and will be offered in Black, Blue, Coral, and White colours. On the software front, the phone is said to be running on Android 9 Pie like other Galaxy A Series models. The report adds that Samsung may release the Galaxy A40 around EUR 250 in Europe (roughly Rs. 20,300). As we mentioned earlier, Samsung has stated that it will unveil fresh Galaxy A-series smartphones on April 10. The company did not share any specifics, but the new phones are said to include Galaxy A40, Galaxy A90, Galaxy A60, and Galaxy A70. The Samsung Galaxy A40 was last seen when the smartphone went live on the company's German and UK websites earlier this month. The smartphone has also received its FCC certification.